I spent Saturday in Napa Valley on a field trip with the Northern California Geological Society, visiting the ultrapremium Promontory vineyards west of Yountville and the merely superpremium vineyards of Harlan Estate west of Oakville. High-end wine is a culture obsessed with the character of land, and Bill Harlan talked a lot about his land as we tasted the 2009 releases from both sites. What struck me most was his emphasis on the forest around the vineyards. Both properties are enclaves of vineyards in a forested setting. This view of woods-encircled vines is from the top of Promontory. Harlan spoke of airs and influences while, given my recent reading, I thought of wild yeasts and soil microbiomes. 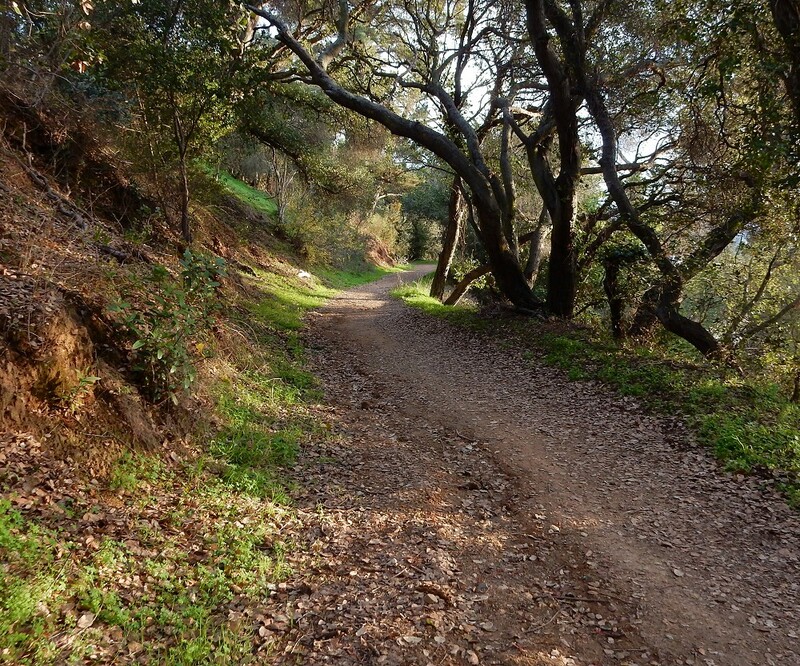 I also thought of Oakland’s woods, which have been on my mind lately as I’ve explored the Leona hills. To some Oaklanders, all trees are good trees. To me, the oak forest is what belongs here, and eucalypts should be exterminated from our wild lands. I’ll spell out several reasons, mostly familiar, plus a new one about living in Anthropocene time. But first, a clump of oaks in the Leona hills. History: Once our oaks were the basis of a thriving native economy, and their acorns are still here in abundance for true locavores. 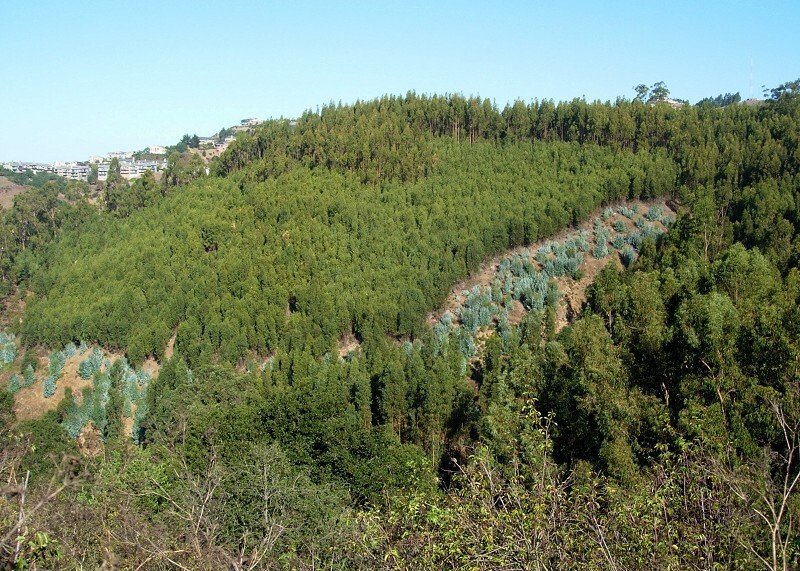 Eucalypts were planted in our hills in a failed attempt to make a killing in timber. The poet Joaquin Miller, spellbound by a Victorian ideal of Arcadia, covered his grassy Hights with thousands more. Neither wave of tree-planting was done responsibly. We owe that legacy of heedlessness the same respect we owe pampas grass, French broom, foxtail grass and other pest species. Here’s a mono-stand near the Caldecott Tunnel. Aesthetics: Our native oaks hug the hills in fleecy blankets; eucalypts hide them in scraggly tufts. 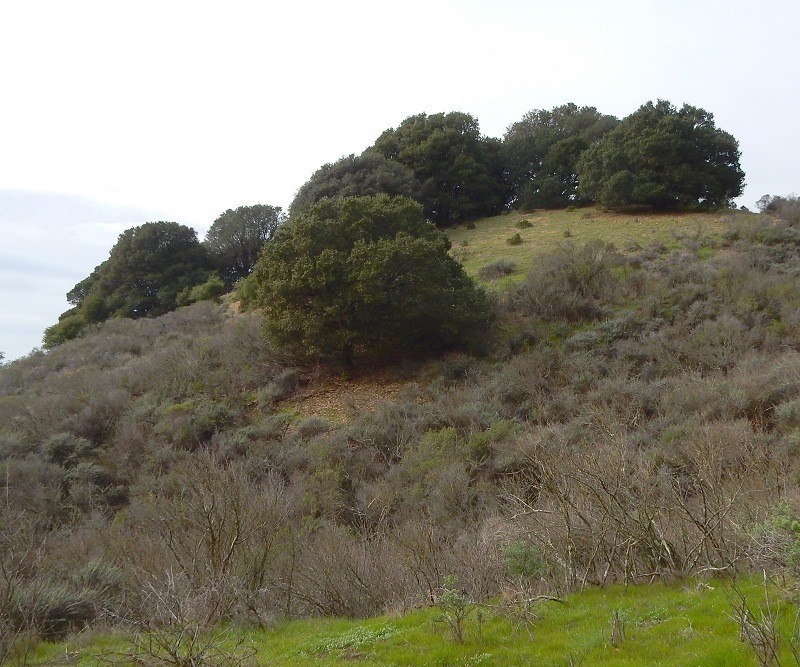 Compare the two types of forest, side by side at Lake Chabot. The very air is different. Accessibility: In my search for rocks, I go off trail and across country. Eucalyptus country is typically impassible, the footing noisy and slippery. 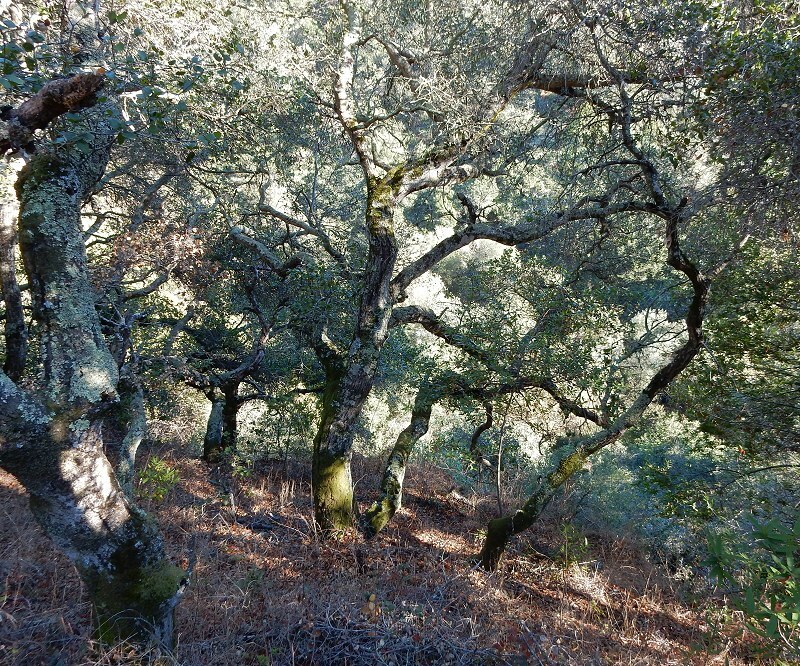 Oak country is typically parklike and quiet, like this grove in the Leona hills — although it’s friendlier to poison oak, I’ll give you that. Ecology: Oaks make food and mulch; eucalypts make trash. The Anthropocene: The future’s climate is up to us. It’s vital that we pull CO2 out of the air. Trees are touted for doing that, but planting and managing forests is a sophisticated practice we’re just beginning to understand. Forests are more than just groves of fixed carbon. By far the majority of a forest’s carbon is in its soil, not above the ground. A newly published study argues that more than two centuries of reforesting the European landscape hasn’t made a lick of difference to its CO2 balance. Because the new forests were managed for timber, the wrong kind of trees were subsidized. Luckily, we don’t harvest timber in Oakland any more, so we can do things the right way. That means nurturing the biomes that suit the region: native oaks, redwood, chapparal and coastal wetland. Their intricate webs of underground organisms, tuned to our rocks and climate over thousands of years, soak up carbon better than any other strategy. Well-chosen eucalypts are splendid specimen trees, but they should be phased out in the wild. If we feed our wildland soils correctly, Oakland can do its share to fight global warming. And it will be better in all the ways I’ve mentioned. 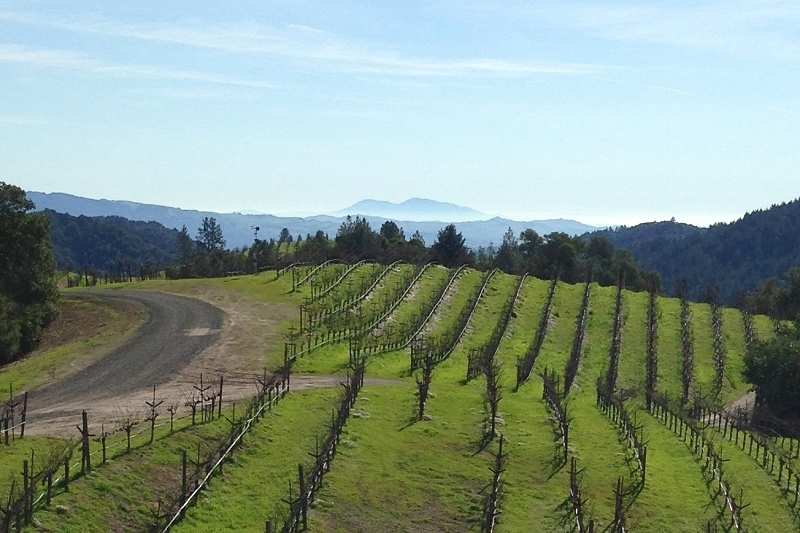 Restoring our land will take time, sustained funding and the same dedication that Bill Harlan gives his vineyards. If we take our ownership of Oakland’s land seriously, we can’t slack. This entry was posted on 8 February 2016 at 8:03 am and is filed under Other topics. You can follow any responses to this entry through the RSS 2.0 feed. You can skip to the end and leave a response. Pinging is currently not allowed. Since nobody seems to want to responsibly repopulate the land with native species, I find it highly unlikely that cutting down huge swaths of a species that l has become a part of the biome to be beneficial. As for ease of passage, I certainly wouldn’t recommend an attempt to walk down a hill covered with dry oak leaves; I took a sled ride in Leona Canyon that was beyond belief that once very nearly killed me. Still, it would be nice to see more riparian, redwoods, oaks, and chaparral. I just think that there will be many unintended consequences with the plan that is in place. It looks like natural fires would have also done in the eucalypts, too, but our urge/need to suppress fire encourages their spread. 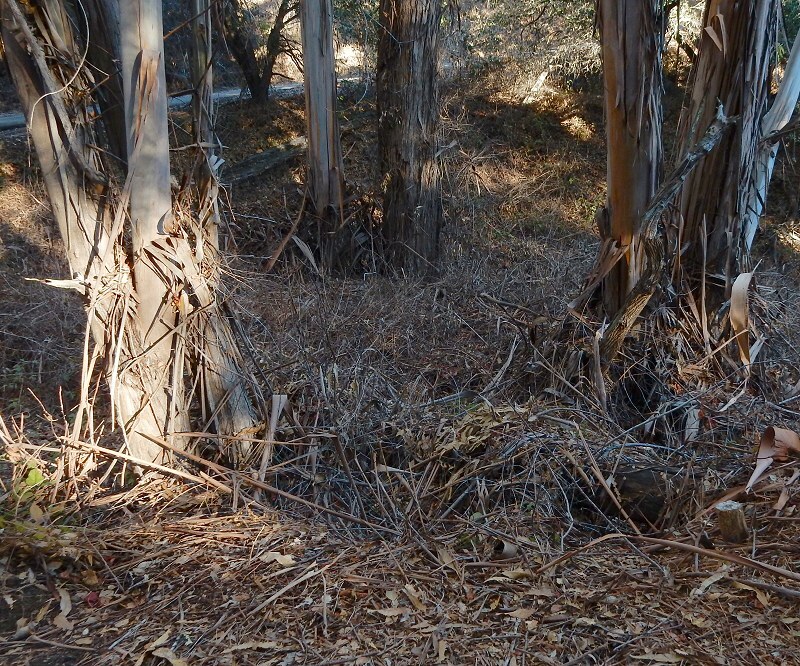 The US forest service and FEMA both agree that Eucalyptus hasn’t the fuel potential that will result in the ecosystem that will result in removing them. The debate is raging, and although it would be amazing to see some semblance of the past. It’s just that we did the deed of permanently changing the land more than a hundred and fifty years ago. We didn’t know what we were doing then and I’m convinced that we don’t know what we’re doing today. When may eliminate forests that will take generations to recover. I love your blog by the way? Thanks for your comment. I don’t know much about California other than that it’s got some amazing and unique flora (sequoias!) that you can’t find anywhere else so I’m sure you know much more about the eucalyptus situation. Here in New Hampshire we have a much longer history of cutting everything down which finally led to the first conservation legislation – think the Weeks Act. Fortunately the forests here have recovered, although we still face huge problems from introduced pests and diseases. You’re correct that we know so little but if we use nature as a guide we can prevent some of the negative consequences of our previous ill-thought-out actions. Admittedly there are plenty of introduced species that we just have to live with – take Zika for example. I’ll check out your blog now myself. What about the over turned Franciscan klippe? Really thoughtful blog, thank you. While the FEMA plan is being litigated, people have time to read more about what happens when you remove the Eucs from public land open space. 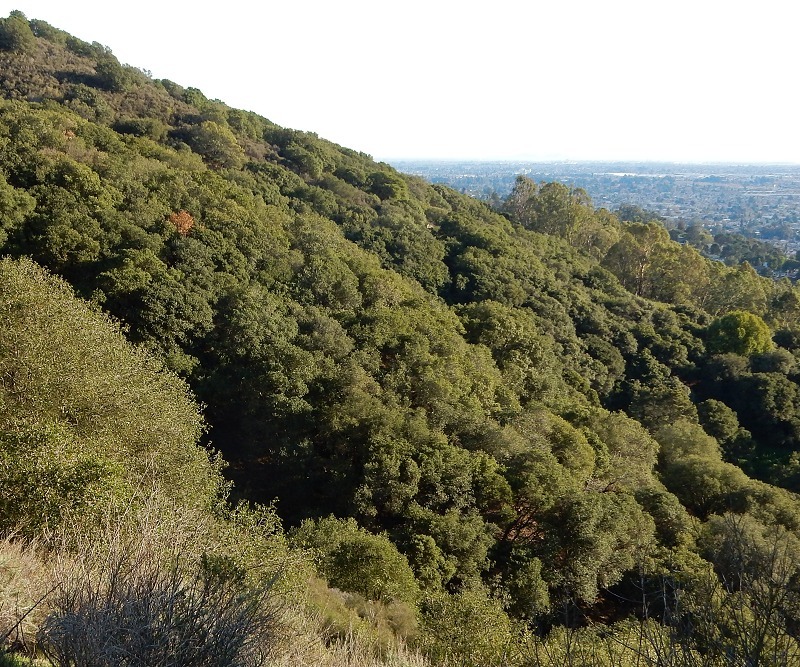 Claremont Canyon is an excellent example of what happens when you give the native ecosystem a chance to recover – the return of oaks, native shrubs and wildlife. Very unlike the dense, monotypic stands of eucalyptus.